I'll admit it. I love presents. Who doesn't, right? I was just thinking about this because it seems like people have been extra generous lately and have given me stuff, without even an occasion as reason. I really appreciate it and hope I thanked everyone proficiently. I also hope to get better about the "just because" gift to people I care about. Yesterday, I received some music from a friend, who shall remain anonymous. I didn't ask for it and really did not expect 10 songs, but was thrilled. It made my drive to work a little more fun this morning too. One of my friends finds the best hamster stuff. Check out these erasers! Gah! I will of course never use them for anything but cuteness. 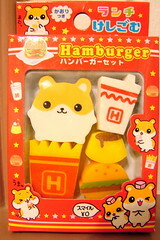 And to teach my hamster about the evils of fast food. 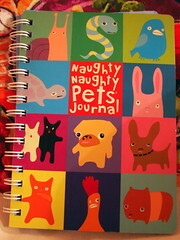 The Wegmans tote bag and Naughty Naughty Pets pet journal were sent to me all the way from an pal in Boston! It was a very thoughtful and moving gesture. Thank you again! 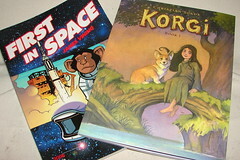 E felt guilty just picking up free comics this past weekend, so he bought First In Space and Korgi for me. For the record, I just took the freebies from the two places I went to. P.S. If anyone is wondering how the Kids In The Hall show was, it was GREAT! The five original guys performed at a tiny local theater. All new material, all really funny. I talked to Dave Foley a bit and was a total dork. And I sold a Snapple to Jason Priestly. So cute! I especially love the erasers. And Jason Preistly? How funny! I can't wait to read your review of the full Korgi book - I am so smitten with the illustration style (that we saw in the FCBD book). wow, you have some very nice friends! 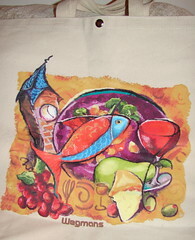 love the hamster goodies! Oh, those pressies are cute. Nice friends!